Magnetic tape: Many of the early computers used tape reels for the purpose of data storage. The tape, which was made out of thin strips of plastic coated in a magnetic oxide, was capable of storing huge amounts of data, and single-handedly changed the way data storage developed throughout the next few decades. Hard drive: IBM invented the first hard drive in 1956, which took advantage of rotating magnetic disks. Early hard drives could only store around 5MB and would cost thousands of dollars, but have since evolved and improved to store up to several TB’s worth of information. Floppy disk: Floppy disks were first introduced as 8” disks that were packaged with envelopes designed to keep them clean. 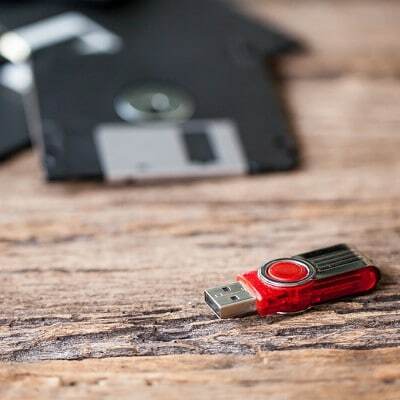 Unlike the hard drive, which adapted to changes in the computing environment, the floppy disk fell out of use and is more of a novelty these days than anything else. USB: USB technology allows for “plug and play” versatility using rewritable flash memory. Naturally, USB storage took off, with users citing its portability as a major selling point for their usability. Modern businesses see a remnant of the magnetic tape trend in modern tape backup solutions, which store data on tapes that can then be deployed in their time of need. Even tape backup solutions, by definition, are outdated compared to modern backup and disaster recovery, which takes advantage of online cloud storage to allow for near-instantaneous data recovery. In general, the cloud has allowed for many great innovations, with data storage being chief among them. By using the cloud, organizations are capable of accumulating and storing an incredible amount of data. Coupled with easy access and practical transportation, the cloud is a wonderful way to use the latest innovations in data storage. Data is both more compact and more mobile than it was in the past, allowing organizations to achieve flexibility and meet their specific needs through consolidation. This is great for several reasons. Businesses no longer have to be held back by the limitations of physical data storage components, and can now access information anywhere via the cloud. Similarly, physical data storage in the form of micro-SD cards, USB flash drives, portable hard drives, and so on, offer significantly more freedom to move data around. Is your business taking advantage of the latest data storage techniques? To find out, give us a call at 307-686-3025.